Often puzzling Cincinnati-goers, all 18 sprawling acres of the Pinecroft Estate reside in the middle of a busy Cincinnati neighborhood, though that wasn’t always the case. Over a hundred years ago, the Pinecroft was a thriving estate owned by inventor, innovator and former owner of the Cincinnati Reds, Powel Crosley, Jr. Filled with original features, the library is the main focus of the first floor in this estate. As was custom in his time, Crosley used the library as a formal receiving room in addition to entertaining, so it’s fitting that this is one of the more utilized entertaining spaces within the manor. Dressed with fine Dwight James Baum-designed windows and a gracious fireplace, the room gives off warmth and elegance to all who visit. The estate is home to a five-acre lake and dozens of gardens, from large sprawling orchards to neatly kept rose gardens and private, intimate gardens nestled outside the library window. The numerous gardens were a common trait of the time for estates of this size, the grounds having been kept up by a grounds staff. Today, we can say the same—the grounds and gardens are maintained, trimmed, manicured and tended to by a diligent and talented grounds staff so that you will always see it at its finest. The Garden Pavilion, as you can imagine, was not always a part of this historic estate. Though it was decided some years ago that in order to preserve the history of the manor and also to provide ample space for large groups of people to enjoy this space, a new, larger space was needed. Instead of adding on to the house, this immaculate clear-walled, soaring ceiling pavilion was added. The addition is certainly newer, but it mimics the Tudor-style so prevalent throughout the historic estate. The Trophy Room is home to one of the three hidden safes within the mansion. This particular safe happened to hide Powel Crosley, Jr’s wine cellar during the prohibition. 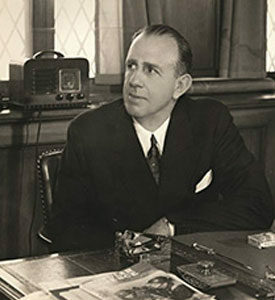 Born in the 1880s, Crosley was a famous Cincinnati native and UC grad, making his fortune in automobile parts and then later putting his engineering mind to work by creating his own radio and selling it for just $35, much less than the hundreds they typically cost back in the 1920s. He soon became the leading radio manufacturer in the world. Before his death in 1961, Crosley would go on to offer the first refrigerator with shelves in the doors, develop lightweight and fuel efficient cars and purchase the Cincinnati Reds, who played at “Crosley Field” until the ‘70s. After years of being unoccupied, the Cincinnati Preservation Association together with Funky’s Catering Events, stepped in to save The Pinecroft Estate and began renovations, enhancing as much of the original charm and features of the estate as possible. The association was wildly successful, as guests and visitors alike often comment on the beauty of the mansion’s many original features.